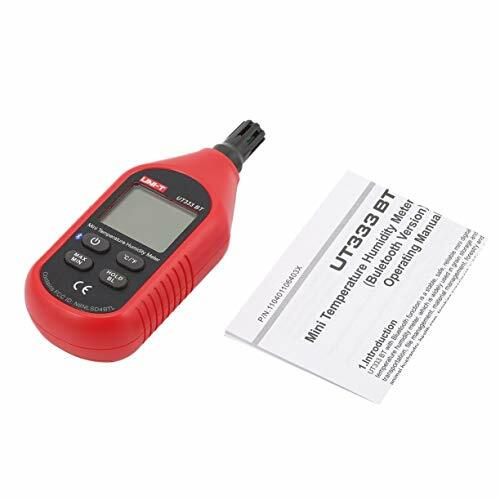 This UT333BT meter can measure temperature and humidity with reliable measurement results. It could connect your phone by Bluetooth to export the data,very convenient. It is easy to read value at night due to the LCD display with backlight. Built-in Bluetooth system,can export the data by Bluetooth. Helpful for measuring humidity and temperature,LCD backlight display,easy for reading. Includes data storage and data transmission function,maximum and minimum value measurement. Temperature unit is switchable: Celsius(°C) or Fahrenheit(°F),data hold. Low battery indication,automatic and manual power off function,compact and light,convenient to hold and carry. Notice: the package list just include one temperature humidity meter and user manual only, other items in the picture are not included.